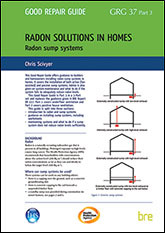 This Good Repair Guide offers guidance to builders and homeowners installing radon sump systems in homes. It covers the installation of both active (fan-assisted) and passive sump systems. Advice is also given on system maintenance and what to do if the system fails to adequately reduce radon levels. This Good Repair Guide is Part 3 in a 3-Part set and replaces the guidance given in BRE Report BR 227. 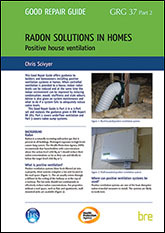 Part 1 covers underfloor ventilation and Part 2 covers positive house ventilation. 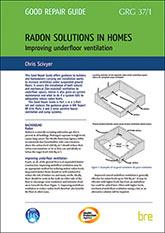 -maintaining systems and what to do if a sump system does not reduce radon levels sufficiently. -Where can sump systems be used? -How does a sump work?